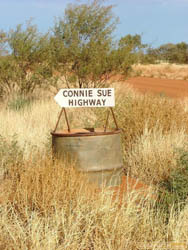 The Connie Sue Highway is another one Len Leadell\'s "highways" and was constructed in 1962. It runs from Rawlinna on the Trans Australia Railway north for 650 km to Warburton on the Great Cenral Road. The southern 350 km section (which is note included in these notes and Gps file) stretches from the Nullarbor plain through to Neale Junction in the Great Victoria Desert. This track note and Gps file covers the 300 km section north from Neale Junction at the intersection with the Anne Beadell Highway. The track is a mixture soft desert sand with rolling dunes and rocky heavily corrugated ironstone stretches with occasional unannounced washouts cutting the track. This is magnificent breakaway country and short detours to some likes of Pt Lilian, Point Sandercock, Sykes Bluff, Ryans Bluff, Point Wood, Hahn Tabletop Hill, Waterfall Gorge, Harkness Gorge and Mackenzie Gorge provide wonderful photo opportunities and should not be missed. The navigation is simple with only two right turns near Warburton to negotiate. Allow at least two days for this 300 km, but due to its remote starting point this track would need to be combined with other tracks to make a trip of possibly up to two weeks duration. As this is remote country with long distances between fuel, no water and only an occasional other traveller, be 110% prepared and carry a satellite phone or HF radio for emergencies. Lower tyre pressures and speed are suggested.